Yes, I know, February was a long time ago… But for those of you who missed out in three great celebrations of Italian culture, I thought I’d mention them so that you can get ready for next year’s events that highlight Italian culture. First, on 11 February I enjoyed a night of high-quality performances at Opera by Candlelight at the Albert Hall. Local musical impresario Carl Rafferty put on an evening featuring opera arias by Italian composers (Verdi, Rossini, Puccini, Bellini, Donizetti, Leoncavallo, Vivaldi and Giordano) and well-known songs from musicals. The young performers were almost uniformly highly skilled, especially Carl’s oldest daughter Kate who now lives and sings in Vienna. Second, on 17 February P&P Events (Paola and Patrizia) put on an amazing evening of entertainment for Carnevale – the ‘Casanova Grand Ball – a Venetian Affair’. It was held in the foyer of the National Museum of Australia and featured a parade by models in elegant Venetian costumes. Over 200 people attended the chic ‘ballo in maschera’ with most of them wearing at least a mask on the face and some wearing elaborate costumes. Then from 17 to 19 February the National Multicultural Festival offered a kaleidoscope of colours, flavours and sounds. Performers from all over the world proudly featured the culture of their country in music and dance, while their more practical counterparts presented hundreds of dishes to the 280,000 people who flocked to the centre of town to enjoy the festival. One of the countries featured was Italy. Our Dante Society was an active participant. On Saturday morning the Dante Musica Viva choir performed on one of the stages for 40 minutes in a range of popular Italian and Neapolitan songs; on Sunday the Society had an information stall to promote Italian language and culture to passers-by, and a few choir members turned up – with Francesco and Rod on the guitar – to sing a few songs in front of the stall to entertain the crowd. The Dante was also a major participant in the Piazza Italia series of stalls that sold Italian food and drinks. 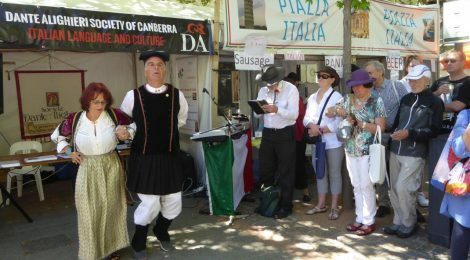 A number of Italian associations collaborated in setting up this Italian space, sharing in the costs of the food and drinks sold, in the roster of volunteers working at the stalls, and in the profits at the end of the week-end. Our President Franco Papandrea was one of the main promoters of the Piazza Italia concept, and a constant presence at the festival especially in his efforts to sell calabresi biscuits called Mostaccioli! Thanks to the Dante volunteers who gave some of their time to work at the food stalls: Luigi (who was almost a permanent feature), Nicola, Lyndall, Ondina, Elda, Denise, Vittorio, Linda, Tamsin and me. Apart from Piazza Italia, on the Saturday the Italian Embassy had a stall in the European Village, located in a street reserved for the 28 countries that make up the European Union. The opportunity to enjoy Italian culture in its varied forms is certainly high during February!